Description: Recorded in 1958, this session comes from a time when John Coltrane had already played in the Miles Davis quintet and the Thelonious Monk quartet, and was frequenting Rudy Van Gelder's New Jersey studio in recording situations backed by the great Red Garland trio. 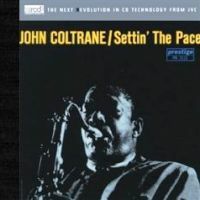 Following the successful albums Traneing In and Soultrane, Settin' the Pace is another masterpiece that shoudl belong to every jazz lover's collection. Trane's sound on the opening ballad is so tender and vulnerable that it melts your soul. The music is wonderful, and this XRCD2 restores its glorious sound in full detail. A must-have for jazz lovers and audiophiles! Recorded in New Jersey, March 1958 by Rudy Van Gelder. Originally Produced by Bob Weinstock for Prestige. This XRCD2 was produced by Akira Taguchi and mastered by Alan Yoshida at A&M Mastering Studios, Hollywood, California.